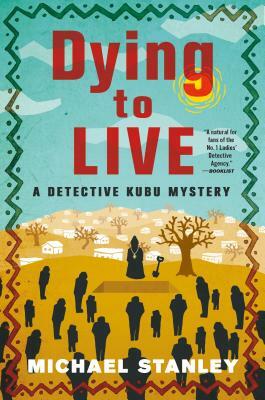 Michael Stanley's Dying to Live is the sixth crime novel to feature the humble and endearing Detective Kubu, set against the richly beautiful backdrop of Botswana. A Bushman is discovered dead near the Central Kalahari Game Reserve in Africa. Although the man looks old enough to have died of natural causes, the police suspect foul play, and the body is sent to Gaborone for an autopsy. Pathologist Ian MacGregor confirms the cause of death as a broken neck, but is greatly puzzled by the man’s physiology. Although he’s obviously very old, his internal organs look remarkably young. He calls in Assistant Superintendent David “Kubu” Bengu. When the Bushman’s corpse is stolen from the morgue, suddenly the case takes on a new dimension. Sears was born in Johannesburg, grew up in Cape Town and Nairobi, and teaches at the University of the Witwatersrand. Trollip was also born in Johannesburg and has been on the faculty of the universities of Illinois, Minnesota, and North Dakota, and at Capella University. He divides his time between Knysna, South Africa and Minneapolis, Minnesota. Michael Stanley is the author of the Detective Kubu Mystery series, including A Death in the Family and Dying to Live.